OK. So hitchhiking isn’t among the greatest of all time – it isn’t up there with things like love, sunsets, and free home-made brownie samples. But it’s still pretty great. 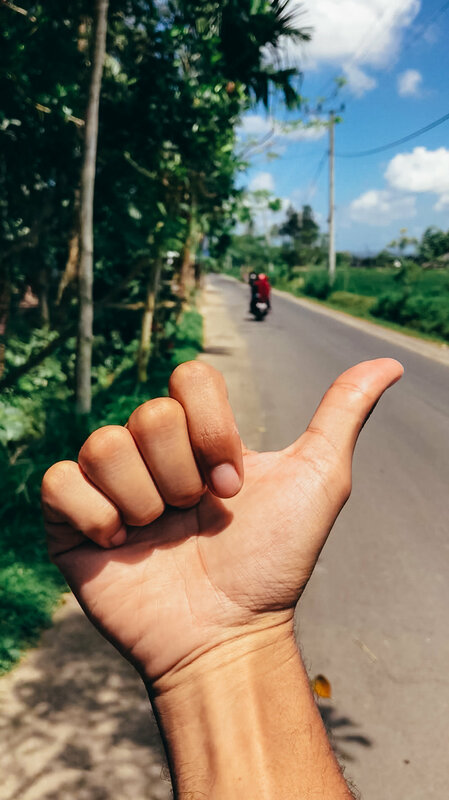 Hitchhiking is the cheapest and one of the most spontaneous methods of travel. 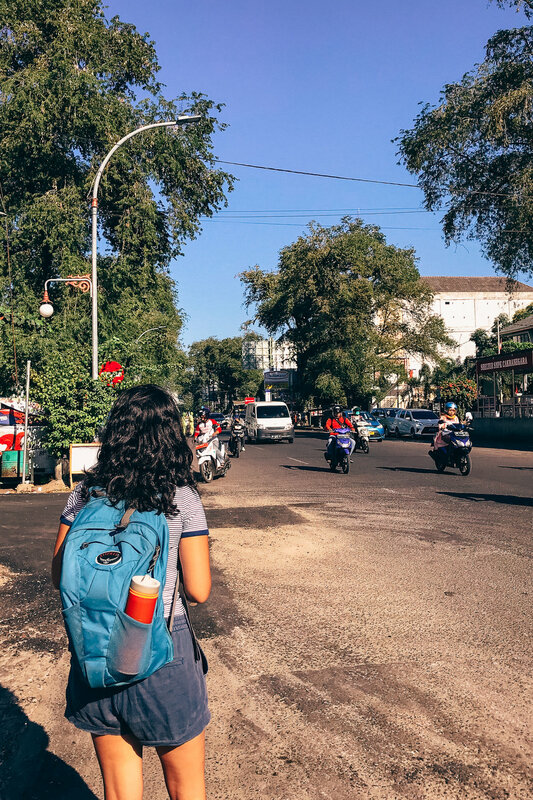 The experience of just picking up a bag, choosing a destination, and asking a total stranger with whom you might not even share a language with if they can take you somewhere is liberating and exciting. Here’s our first hitchhiking story. When in Indonesia, you bargain. It’s the way of life for non-locals there. 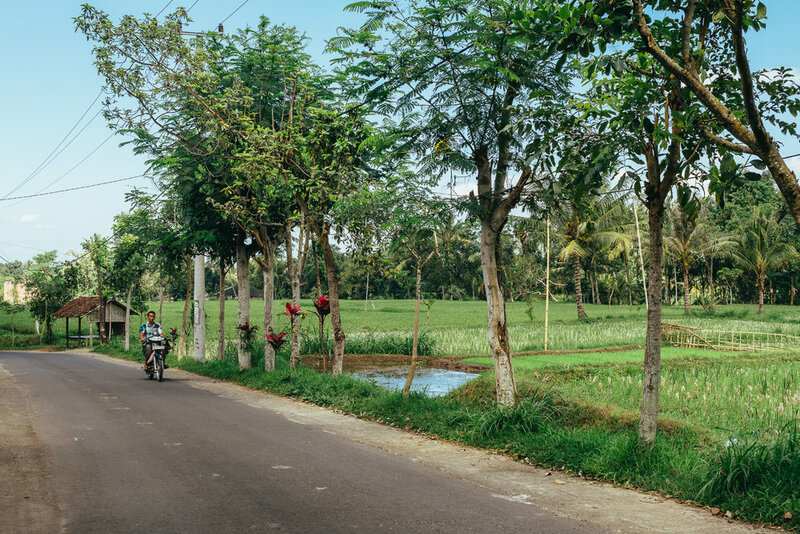 Hence, our day in Mataram began with a string of haggling to find the cheapest transportation that would take us to Tetebatu, where we could explore some of the rice fields in the area. We woke up early morning, took a standard taxi over to the Mandalika bus station ($1 ride), and started the haggling campaign with the first group of people we found so that we could gauge prices for our trip. The trip that we were looking to take, on public transportation (aka a long-distance “bemo"), should cost a total of 80,000 Rupiah. This would get us as close as possible to Tetebatu, as there's no direct public transportation that takes you there (per our research). “Tetebatu? For two?” The driver stares off into space as if trying to solve global warming. He’s really just calculating how far he can realistically push the price without laughing. “Four Hundred.” He’s asking for 400,000 Rp, but probably wants 350,000 Rp. Both of these are relatively laughable, considering that we specifically came to the public bus station to find cheap bemo prices. So, we laughed a bit. Now he’s laughing. He calls his friend over to join in on the insanity of our request. We were bargaining because we wanted to do things like locals – no private rides. Although the amounts they were asking for were relatively insignificant for visitors, we were on our backpacking budget and at the public bus station for a reason: We wanted to ride in a shared tin-can car for a few hours, and we wanted to save some money. In search for the cheapest route, we encountered more of the same. We would ask for low prices and public bemos only to be offered premium prices and chauffeured vehicles. After this bargain-exchange happened another 3 times in the same small area (they had probably pigeonholed us as weekend-tourists), we finally found our salvation: a rundown bemo with a missing door looking for customers. “We’re going to Tetebatu. Take us as far as we can go for 40 [40,000 Rp] in that direction,” we told the driver, exhaustedly. It turns out 40 doesn’t get you very far. We got off the tin-can car at an intersection situated right in the middle of nowhere. Well, it wasn't Tetebatu, but we were on our way there. Our options were to now walk for a few hours (public transportation didn’t seem to be readily available anywhere nearby) or sticking our thumbs out. Marta hesitated exactly 0 seconds in trying to find a car, all while I tried to regain feeling in my backside. (Bemo chairs can be unaccommodating.) Within 2 minutes, a friendly pair of Indonesians in a pickup truck stopped and asked where we were going. “Tetebatu,” we said in a hopeful manner. Smiling, they nodded and signaled us onto the truck. My favorite view from the back of the pickup truck. The faces we got while on the back of that pickup truck were priceless. 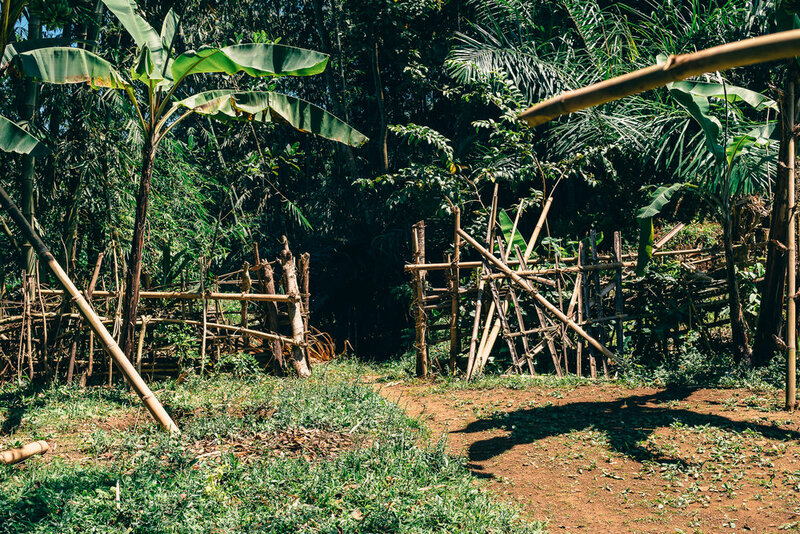 The thirty-minute ride took us through villages where seeing a “bule,” or a foreigner, was rare. But here were two bules on the back of a pickup truck next to a strapped-down motorcycle. We were probably the strangest cargo most of them would see that week. When they dropped us off, still smiling, they waved goodbye, turned the car around, and drove off. In the opposite direction. They drove us to our destination despite not needing to go in that direction. Not only did we arrive safe and intact, but elated for having been witness to a kind and selfless act. The initial hitchhiking led to more spontaneity. At our make-shift bus stop was a guy by the name of Aziz, along with two young teenagers. They all spoke more than enough English for us to communicate that we wanted to visit rice fields, and wanted to know what direction to walk in. Naturally, Aziz offered us a tour through a nearby rice field. Time for some more haggling. Fortunately, this exchange turned out much better than earlier because he agreed to lower his spontaneous-tour price to a reasonable level. After we agreed, he spoke to the two teenagers at the "bus stop" and quickly arranged the extra scooter ride we needed to approach the rice field we were about to tour. 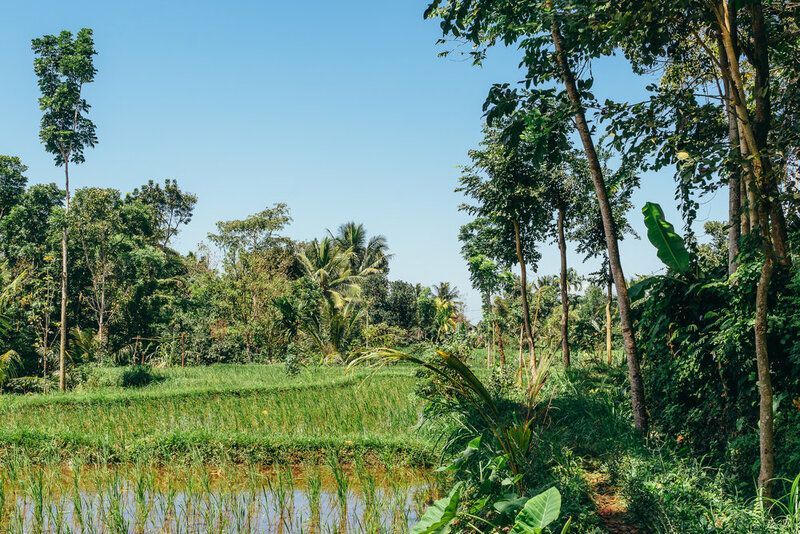 On our way to the rice fields. I'm on another bike. Although we had a great time at the rice field, this is about hitchhiking and all that led to it, right? So we’ll leave that part of the story for another day. Suffice it to say that I’m now more aware of where I stand when I’m composing a photograph, and Marta is as scared of snakes as the day she came into Indonesia. After walking back and listening to the details of what it’s like to be a male in Lombok trying to marry an Indonesia woman (the customs are extremely interesting and different), we had another small conundrum. How would we get back to Mataram? Back to hitch-hiking it is. What’s the worse that could happen? We stuck our thumbs out and waited. For about an entire minute. Then we were picked up by the least-expected group of people. Mr. Jujitsu not pictured – he's off to the far left. 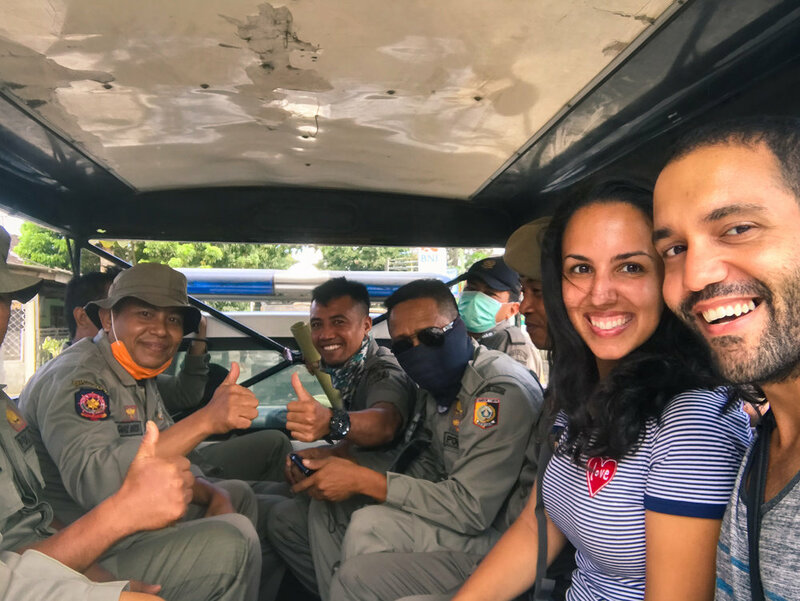 A truck full of the city’s cops (or rangers – we weren’t entirely clear on that detail), all ecstatic to be able to help, offered us a ride to wherever we needed to go, with fun conversation to boot. The captain, whom we came to know as Mr. Jujitsu, was one of the friendliest people we had met, attempting to carry out conversations with us despite not knowing much English at all. Ironically, this hitchhiking attempt resulted in what was probably the safest transportation I’ve ever been in. Not exactly what I was expecting when we started the day bargaining for rides to Tetebatu. I also believe we were in more selfies in that truck than ever before, but that’s besides the point. We had an awesome time. Our return to the original bus station after that was rather ordinary, at least in comparison to everything else that day. Once on the main road, we were able to hail down another tin-can car for the right price. After that, a $1 taxi back to our hotel. It was 3 in the afternoon and we still had over half the day left to explore. What next? We could have avoided all of these side-adventures and just paid the few extra dollars it would have cost us initially to take a private ride with Mr. Four Hundred. 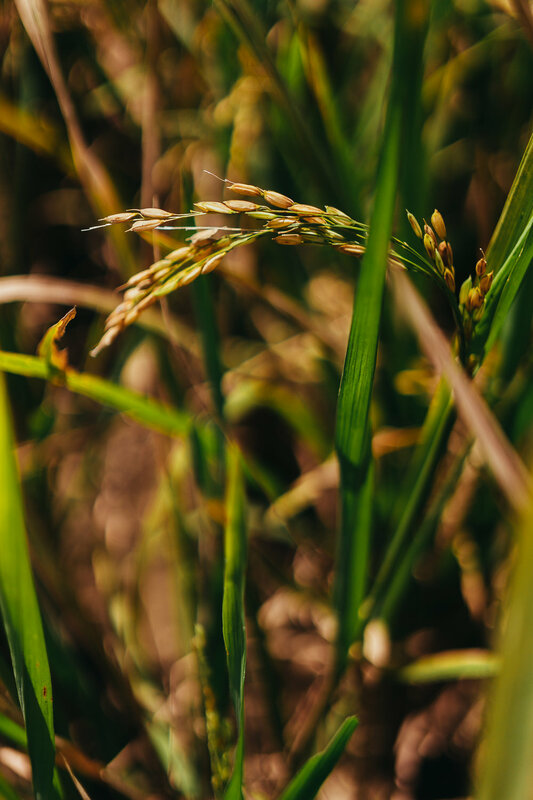 He would have dropped us off at a random rice field, waited for us to stumble through it, and then transported us back, silently. It would’ve made for a slightly different story, I think. So why hitchhike at all? We won’t be doing it all the time – it obviously depends on how safe you feel the area you’re in is. Also, how structured your day is and how much time you have to accomplish the tasks you’ve set out for that day. We were lucky to find rides almost immediately, but let’s not forget – time is the most important resource; it’s invaluable and irreplaceable. And it could take quite a while to find your ride. Yet, the feeling of freedom that comes from just accepting life as it unfolds, the adrenaline you feel from walking out of one spontaneous event and into another – I wouldn't trade that for anything. So, you don't just hitchhike because it's free. You hitchhike to unravel the unknown and experience the unexpected – to connect with people around you that you otherwise never would have met and to create stories with them.